What was meant to be a lighthearted caper sinks like a ton of lead. Plus, technically accomplished pabulum for poppets. DEC 26, 2010 – IN THE IMPROBABLE EVENT that a case is made for Farah Khan as an auteur, her leitmotif would be the assumption of another identity. In Main Hoon Na, her first and finest film, an army officer assumes the identity of a college student. In Om Shanti Om, her middling follow-up, a young actress assumes the identity of an older star. Now, in Tees Maar Khan, a conman named Tabrez (Akshay Kumar) assumes the identity of a filmmaker in order to make away with a consignment of antiques. And looking at this shapeless, graceless, charmless, rhythmless mess, you could be forgiven for wondering if the director herself hasn’t assumed another identity, trading her brashly (and confidently) witty self for someone so unsure of her instincts, so desperate for a hit, that the soundtrack practically creaks and groans with the exertions. Farah Khan used to be effortlessly fun. Now she’s holding a gun to our head and demanding that we laugh. The difference is dismaying. Almost all the good gags announce themselves in the first few minutes – the cheerfully bizarre opening-credits number that plays like a James Bond titles sequence set in a sac of amniotic fluid; the thieves, competitors to Tabrez (aka Tees Maar Khan), with delectably demented modus operandi that I won’t spoil for you; the announcement of Tabrez’s pregnant (and movie-mad) mother when her water breaks. (“Tanki phat gayi,” she wails in front of her black-and-white television set, watching a scene from a 1970s potboiler where a fully filled water tank explodes.) A little later, Katrina Kaif (as Anya, Tabrez’s bubble-headed starlet-girlfriend) makes her entry in the well-shot, well-scored Sheela ki jawani song sequence, brandishing a belly button that seems to have a life of its own – and as the curtains come down on this number, you might just as well leave. The film, hereupon, sinks faster than an iceberg-struck passenger liner in the mid-Atlantic. A lot of failed entertainers give us the sense that fun was had at least at the scripting stage – that heads were thrown back, thighs were slapped, sides were split – and we tell ourselves that none of this translated to the execution. But with Tees Maar Khan, there isn’t any sense of enjoyment even in the writing phase, unless you imagine hoots and fist pumps for such high-school-level gags as the one where an airplane carrying a wanted criminal is named Con Air. Ha ha! The rest of the film unfolds as a procession of dreadful dialogue, endlessly repeated, and unfunny in-jokes – a reference to the long-gestating Mr. India sequel, or the sledgehammer poke-in-the-ribs about an Oscar-hungry Bollywood star (played by Akshaye Khanna, whose presence in a film, for a while now, has sadly turned into a surefire signifier that it’s going to be a stinker). For a story supposedly structured around a train heist, there are alarming shifts in tone, like a segue into sentiment with Tabrez’s growing affection for a band of villagers terrorised by a headless ghost on a horse. Free-associative nonsense, in theory, is as valid a way of making movies as any, but when the filmmaker’s instincts are unsound, it becomes plain nonsense. Tees Maar Khan is simultaneously frantic and flat, like a hasty gulp from bottle of beer that’s been left uncorked for months. Farah Khan’s signature moment would seem to be the generous closing-credits party she orchestrates for her cast and crew – but there’s a moment in the film that’s monumentally more significant. Tabrez decides he’s going to throw himself an Eid celebration. It’s long past Eid, but he doesn’t care because every day, for him, is a festival. He picks up the phone and dials the number of Salman Khan, who, of course, he’s so intimate with that he uses the nickname of Sallu. The latter arrives, makes the festivities more festive, and leaves. And looking at Tabrez here, you wonder if that’s Farah Khan herself. Every film she makes, she throws herself a celebration. With her dizzying array of intimate insider-contacts, she has to barely pick up the phone and stars descend on her sets in twinkling droves. Perhaps she’s the real Tees Maar Khan, the conwoman who’s just made off with a couple of precious hours of our lives – and after making us pay for this privilege. IF THE GENIALLY LOOPY Asterix characters acquired pan-Indian accents and wandered onto the sets of Who Framed Roger Rabbit, the result might be something like Kireet Khurana’s Toonpur Ka Superrhero. 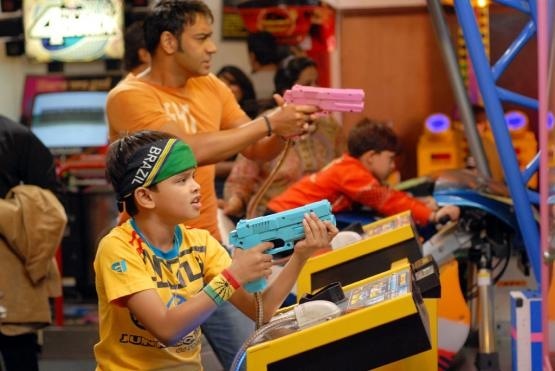 Aditya (Ajay Devgn, cast opposite real-life wife Kajol, who plays his on-screen wife as well) is an action star kidnapped by the cartoon residents of Toonpur in order to decimate the resident villains. The intent, apparently, is manic mayhem hewn to video-game rules, but the result is… Well, is there any point carping about a mix of animation and live action aimed squarely at kids? But surely even films seeking to occupy children can strive to be more than just the blandly competent (and brightly coloured) fare that plays routinely on kiddie channels on television – pabulum for poppets! I suppose the one time I cracked a smile was when the Cacofonix character – a Bappi Lahiri look-alike – loses a blingy necklace and wails, “Chain bina chain kahan re.” The well-placed PJ can enhance any experience – well, almost. ‘those of us who delighted in Main Hoon Na, who enjoyed its knowing and deliberate invocation of the silly seventies, are upset that someone we counted on as a surefire cure for the blues has herself turned out to be the cause of a minor bout of depression’ – that was me! TMK proves that there can be something like ‘too much farce’ and over-spoofing. It happened with Golmaal3, which worked for me, but it might not work for everyone. On second thoughts, I was wondering if the two movies I enjoyed this year (among others) were Dabangg and Band Baajaa Baaraat, felt good to see because of the thought and planning that had gone into authenticating the environment that it was filmed – the village, the houses, Delhi, the accents, the mustaches, etc. Even a supposed masala flick like Dabangg had the hero’s house that looked like it was built there, and the extras looking like ‘normal’ people. Sadly, Farah Khan seems not to have that much time to research it, what with being a mom, anchor, judge and then again a director. Even OSO sets were unreal, but maybe the audience overlooked them as it was a ‘movie inside a movie’ so should look like that. Sadly, your apprehension about the movie ultimately becoming a hit might become true. And then, we will have more copy-cats…sigh!!! thanks for t m k review saved my time and money! Not sure why Kamal still does inspired movies. He has good talent to make his own movies or many true fans are all really wrong in the assumption. — when something that cost the GDP of small nation — Is it that costly? What with most of the scenes being shot in Malshej Ghat & studios, I don’t think its a big budget flick. Your’re spot on in your final analysis, the movie was made only to con the audience. Man, when was the last time you wrote such a scathing piece?! Rakesh: “Screenplay by Spouse Syndrome” — simply fantastic observation 🙂 I didn’t know Abbas’s wife wrote JHS. I thought he wrote it himself. Yet to see it. Apu: Actually I didn’t mind the lack of authenticity. That’s not really important here. What bugged me endlessly was that I’d signed up for a Farah Khan film and I was left with an Akshay Kumar comedy. I really have very little patience with the latter. BR, I was not too worried about the lack of authenticity immediately. It had not worried me too much in Golmaal 3, and it was an equally brain dead movie. But I guess I got restless by the over-simplification, over-dumbing down, over…well, I am limited by my vocab. And then, I realized that even the “background” or peripherals are not interesting, hence the comment. In case of Dabangg or BBB, my attention was also engaged by the surroundings, so it felt more like a “complete” movie experience. I am sure I am making a bad job of explaining myself, but TMK was such a letdown for masala lovers like myself! “Chain bina chain kahan re.” : Fantastic. If that was the case Farah could have easily got good review written as well. Why did she not do it? Thanks for the fantastic review Brangan. What a disppoitment!! unless it accidently becomes successful (I hope not), The entire industry would curse Farah for stealing the most important release date of the year and delivering such a big mess. For one atleast i am happy that one thing is quite clear now: Dabangg is undoubtedly now the best Hindi film of the year. Munni will definitely get an edge over sheela because of the film’s success, even though the latter must have been shot better i guess. Some say its because it does not have her two times lucky mascot SRK but i disagree. All the flaws of the film appear to be more from technical aspects than performances. The ending statement was ultimate in your review- Since the news that farah is making a movie with Akshay came, even I was at the minimum hoping that this particular Akshay movie should be better than his other disaster comedies. Sadly that has apparently not happened. Thanks for saving my money. Most Akshay Kumar comedies are significantly funnier than this. Anurag: Xmas is the most important release date of the year? I thought it was Deepavali! Oh man, that was a brutal review – a blizzard prevented me from going to the theater but it seems like it was the Almighty sending a message ! Maybe I’ll still go and see it just for the heck of it. Rakesh – that is an excellent observation – ‘Dhobi Ghat’ might work as Kiran Rao has directed it too (as opposed to just screenplay in the other cases). Bade – I think Anuraag was probably referring to last 2 decembers with ‘Ghajini’ and ‘3 Idiots’ (you can even add ‘Tare Zameen Par’ to that), but prior to that Diwali was the biggest release day, IMO. my only hope is that people tire of this akshay brand of comedy (just as kabhi alvida na kehna was the death knell for the shah rukh senti melodrama). is that a vain hope? i thought chandni chowk wd do that for him. and this guy apparently is asking for 5-6mm dollars to play dawood in ekta kapoor’s movie! all the best to them. i dont live in india but was there on holiday last 3 weeks and i was hard pressed to find one promo that had one interesting or witty line – if that was teh case, i can imagine how the movie wd have been like. i always envied a film reviewer’s job (you are simply brilliant) but after drivel like this, feel quite a bit of sympathy for you!! surprsied that you didn’t (hear about or) notice that this Kunder spouse has lifted TMK’s plot from Peter Sellers’ “After the Fox”. I have come to the conclusion that the Akshay Kumar meme may be the strongest of them all- at least the Farah Khan meme is powerless before it. I mean, I think even if K. Asif rose from the dead and remade Mughale Azam with Akshay Kumar , that movie would turn out to be an “AKSHAY KUMAR COMEDY” , such is the resonance and harmony of the Akshay Kumar meme with other memes of the stratosphere and forces of nature in general.